A team library is a shared space for any size team. They are like Slack channels for documents. Each team library is shared with a specific set of people: say the entire company, a specific team, or a project. 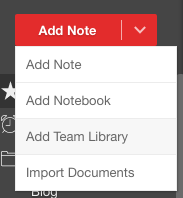 When you add a new note to a team library, it is automatically shared with the entire team. No wasting time on setting permissions. Or worrying about having to give access to everyone on the team. Just create and it’s automatically shared. To create a team library, click the drop-down arrow next to the Add Note button in the sidebar. Then choose "Add Team Library" from the list. You'll be given the opportunity to name your team library. This is usually your company, department, or project name. Click on your team library in the sidebar. Then press the red Invite button that shows up on the right. 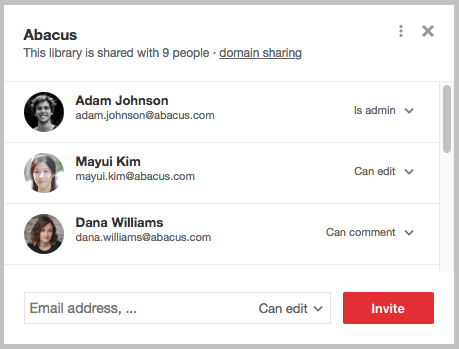 From the library sharing dialog, you'll be able to add new team members by email address. You can also re-send library invites to members who have not yet accepted their invite. And finally, you can remove team members from this dialog as well. You also have the option of enabling domain sharing so that this library is automatically shared with everyone who has access to an email on the same domain. Notes are organized in notebooks within team libraries. You can create as many notebooks as you like within a team library. This is helpful to organize notes within team libraries by project, by sub-team, or organization. A "General" notebook is created by default for you. Right-click your team library in the sidebar and select "Add Notebook" to create a new notebook within your team library. You can easily collapse libraries in the Notejoy sidebar to hide their notebooks. Just click the folder icon to the left of the library to collapse & expand it. This makes it easy to clean up your sidebar to help you focus on the projects you are currently working on. To change the order team libraries appear in the Notejoy sidebar, just drag them to exactly where you'd like them directly from the sidebar. 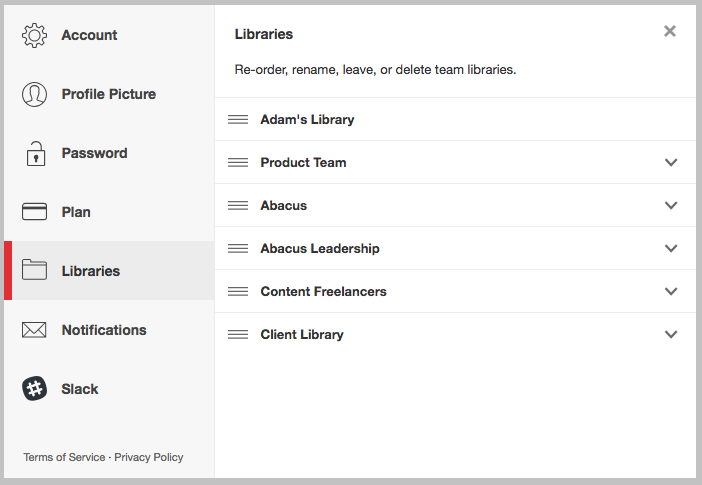 To manage multiple team libraries at once, navigate to the Settings area in the Notejoy app and then select Libraries. You can reach settings from clicking the arrow next to your name at the bottom left, or navigate directly here.